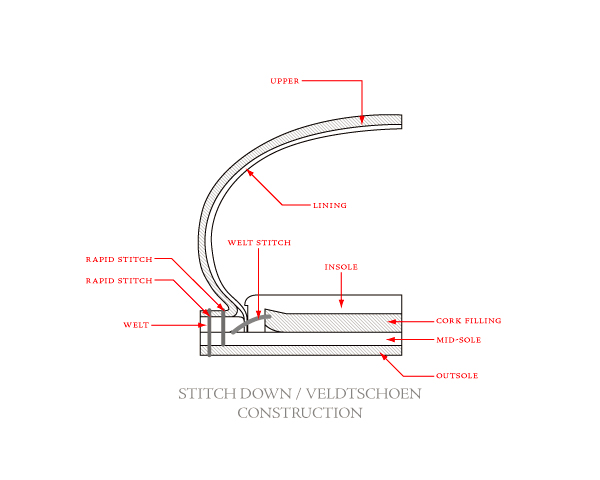 Stitch down, San Crispino and Veldtschoen are three similar construction methods. Veldschoen is a more advanced construction similar to Norwegian construction while Stitch Down is an ancient way to construct shoes. Both methods folds the upper over the outsole where it´s stitched down. 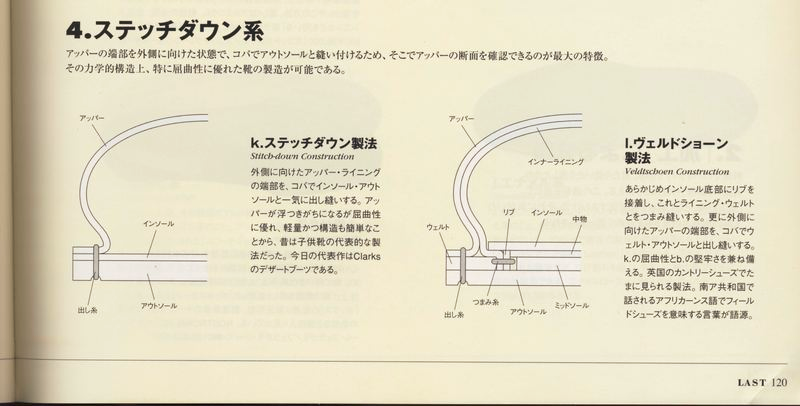 This is creating a water resistance. 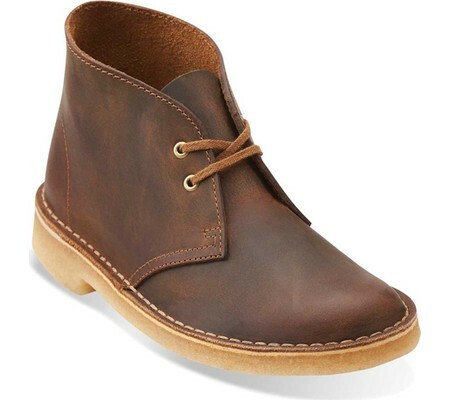 A well known product are the Desert Boots by Clarks using a stitch down. Together with moccasin and sandal constructions stitch down is considered to be one of the oldest construction methods. The upper is finished and the last is prepared with an insole on the bottom. 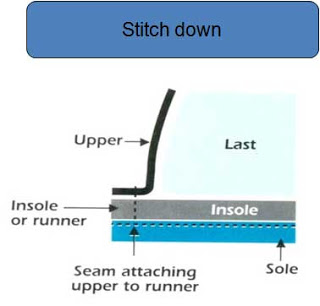 To attach the insole to the upper and at the same time last the shoe a stitch down machine is used. This machine is pulling the upper material to ensure correct lasting at the same time as stitching through the folded upper, insole and outsole. This could also be done manually by hand stitching. There are two types of San Crispino construction. 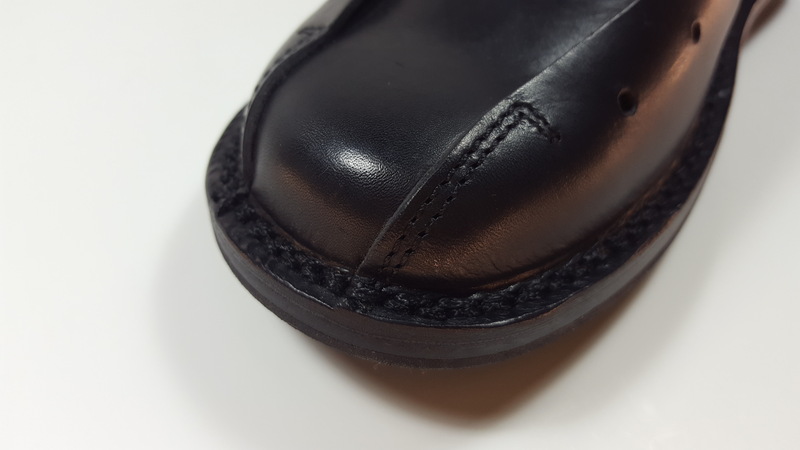 The first is done very similar to Stitch down construction but the upper is folded around insole before stitching connecting the outsole is added. 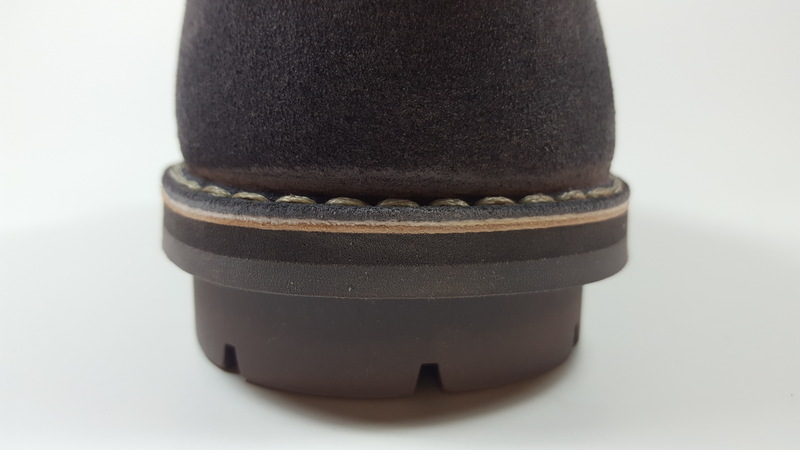 It can also be a vulcanized or cemented process where the upper is wrapped around the insole and then stitched as below picture, classifying it as San Crispino construction. The outsole is later attached either by cement or with vulcanization. An alternative type of Stitch Down/San Crispino but with cemented or vulcanized outsole. Comparing with Stitch Down, Veldtschoen is a more complex process more similar to Norwegian construction, just omitting the welt. Similar to Goodyear welting and Norwegian construction the insole is prepared by gemming (Read more about it here). Then the upper is lasted for next step to attach the welt. However, instead of folding the upper underneath the welt a flat welt is used where the upper is folded on top. 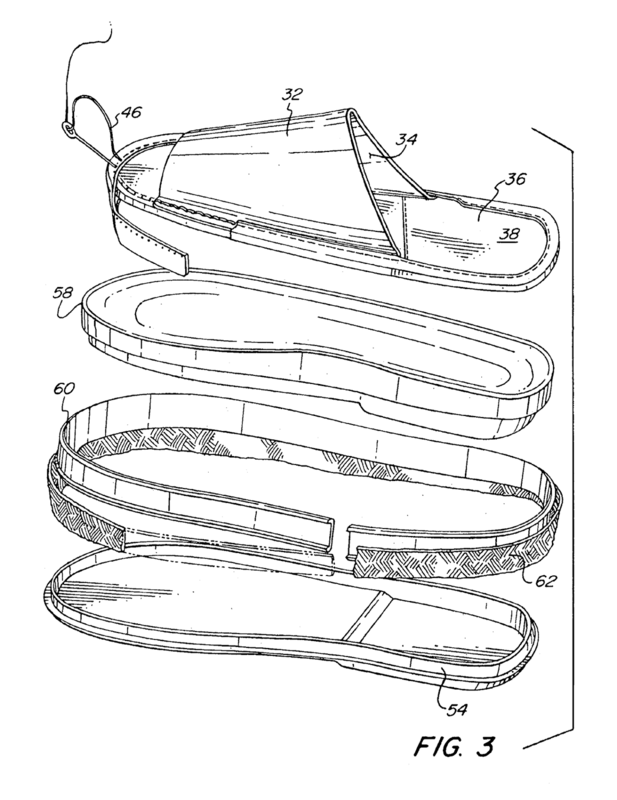 Rapid stitches (Read more about it here) are used to attach upper to mid- and outsole. This secures a good water proofing since upper is not punched through towards interior of shoe or leaves any gap between welt and upper. Veldtschoen construction. Note the welt stitch joining insole/gemming with welt, differentiating it from normal Stitch Down and San Crispino. 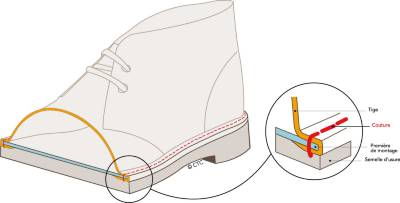 The cavity created between the welt, gemming and insole is covered by a filler. Normally in cork, cork mix or felt. This is put in place with a mix of filler material and glue. Over time the filler usually collapses so upon resoling it´s common to also change filler. With the upper lasted, the midsole gemmed and upper welted everything is joined together. Majority of Veltschoen constructed shoes are boots where a single outsole is not common to use. Normally a midsole is attached by stitching and then an outsole to cover everything. If a leather outsole it´s normally stitched and if for a boot construction it´s usually cemented in place. Another kind of stitch down construction is the unique "Ideal" only produced with a very limited number number of manufacturers around the world. What makes it unique is how it features an outsole with an offset in the tread pattern, leaving room for a heavy stitch to stitch down the upper to the welt and through the outsole. The ideal construction creates a characteristic waist to accommodate the stitching. Ideal construction creates a characteristic waist. This construction is further developed by Masolini 1949 into what they call a Ideal Special Strong, which features double stitching for increased durability and for a more engineered look. Stich Down is one of the oldest ways of making shoes and at it´s core a basic technique: stitching the upper material flat on an outsole. Originally the The English translation of ‘Veldtschoen’, the 17th century Cape Dutch, now South Africa, name for what is technically known as a stitchdown, is ‘field shoe’. In modernised Afrikaans the familiar footwear is known as a ‘veldskoen’ or a ‘velskoen’ – the former meaning field or bush shoe, and the latter skin shoe. The stitchdown as we know it today is sometimes credited to the Dutch Voortrekkers and Pioneers, as a product of the African bush. A rough shoe made of untanned game hide used on an event called “the great trekk” (read more chapter Chukka Boots). By the simplest definition of construction, the upper was out flanged and stitched onto the sole and runner. The original workshop for producing veldtschoens was near Algoa Bay at a place today called Uitenhage.